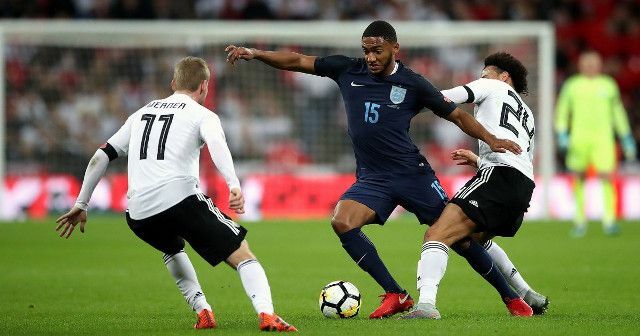 Wembley played stage to a mature and composed England senior debut from defender Joe Gomez on Friday night. The Liverpool man earned a surprise call-up to Gareth Southgate’s squad earlier in the week, and was deployed earlier than expected when he was introduced in place of the injured Phil Jones in the 25th minute. He was granted the added bonus of an opportunity in a side consisting primarily of experimental players, all of whom were similarly fighting to prove they deserve to be involved moving forward. Gomez slotted in as part of a defensive trio alongside Harry Maguire and John Stones, flanked by wing-backs Kieran Trippier and Danny Rose. The width of England’s defensive shape worked in the 20-year-old’s favour in terms of allowing him to implement the approach he takes as Liverpool’s right-back, as well as testing him in the kind of central role Gomez himself deems to be his future long-term position. Much in keeping to his performances under Jurgen Klopp, Gomez boasted a composure and maturity of someone with far greater experience. With the exception of a couple of nervy touches around Manchester City’s Leroy Sane, he looked comfortable and confident enough to pluck high balls out of the air, play forward passes into midfield and spray the odd cross-field pass to a teammate. He channelled the aggression and physicality Klopp has requested from him at Liverpool, and demonstrated why he has been able to hold down a place in the Reds’ starting lineup at such a young age. It marked a deserved reward for a man who has worked admirably to rediscover his top form having endured such a torrid time with injuries since arriving on Merseyside in 2015. After being named captain of the England U21s team, Gomez will feel he has the platform to push for a long-term place in Southgate’s ever-changing cohort. Places are very much up for grabs and it won’t only be Gomez from England’s youth ranks that will be eyeing up opportunities to impress.